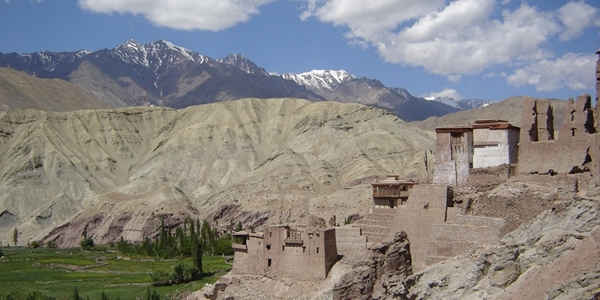 The Nubra Valley lies to the north of Ley and was once the gateway to the ancient Silk route. The valley has vast alluvial plains and bacterian camels, which roam the sandy banks of the Shayok River. The geopolitical evolution tended to transform the Nubra valley into a unique bubbly place opened to foreigners only since 1995. Lying approximately 400m lower than Leh, Nubra sports a much milder climate, which enables its inhabitants to cultivate more extensively, as compared to their counterparts in the main Indus valley. This trek is one of the least travelled and the sheer beauty of the unspoiled landscape will leave you with a true sense of well being.There are also some stunning views of the Karakoram ranges. The beauty of the trek is surpassed only by the final day–a spectacular bus or jeep ride over the highest motor able road in the world (5606 m). The trek starts in Phyang, which is 23 km west of Leh and ends in Hunder. This village is the last point open for Trekking in Shyok valley. From here we organize our ride back over Kardung La 5600 m, the highest motorable road in the world. Day 07: Hunder-Leh (7hrs ) trek ends / transfer hotel.